Neural cell adhesion molecule (NCAM), also called CD56, is a homophilic binding glycoprotein expressed on the surface of neurons, glia, skeletal muscle and natural killer cells. NCAM has been implicated as having a role in cell–cell adhesion, neurite outgrowth, synaptic plasticity, and learning and memory. The extracellular domain of NCAM consists of five immunoglobulin-like (Ig) domains followed by two fibronectin type III (FNIII) domains. The different domains of NCAM have been shown to have different roles, with the Ig domains being involved in homophilic binding to NCAM, and the FNIII domains being involved signaling leading to neurite outgrowth. In nerves, NCMA1 regulates homophilic (like-like) interactions between neurons and between neurons and muscle; it associates with fibroblast growth factor receptor (FGFR) and stimulates tyrosine kinase activity of receptor to induce neurite outgrowth. When neural crest cells stop making N-CAM and N-cadherin, and start displaying integrin receptors, cells separate and migrate. Tumors that are CD56-positive are myeloma, myeloid leukemia, neuroendocrine tumors, Wilms' tumor, neuroblastoma, NK/T cell lymphomas, pancreatic acinar cell carcinoma, pheochromocytoma, paraganglioma, small cell lung carcinoma, and the Ewing's sarcoma family of tumors. 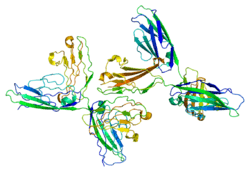 NCAM has been used as a target molecule for experimental antibody-based immunotherapy. Successful radioimmunolocalisation of metastases was demonstrated after giving injections of NCAM-binding 123J-UJ13a or 131J-UJ13a radioimmunoconjugates to children with neuroblastoma. Patients with small cell lung cancer were treated with the anti-NCAM immunotoxine huN901-DM1 in two different clinical studies, revealing acceptable toxicity and signs of clinical response. ↑ Reyes AA, Small SJ, Akeson R (Mar 1991). "At least 27 alternatively spliced forms of the neural cell adhesion molecule mRNA are expressed during rat heart development". Molecular and Cellular Biology. 11 (3): 1654–61. doi:10.1128/mcb.11.3.1654. PMC 369464 . PMID 1996115. 1 2 Suzuki M, Angata K, Nakayama J, Fukuda M (Dec 2003). "Polysialic acid and mucin type o-glycans on the neural cell adhesion molecule differentially regulate myoblast fusion". The Journal of Biological Chemistry. 278 (49): 49459–68. doi:10.1074/jbc.M308316200. PMID 13679364. ↑ Becker CG, Artola A, Gerardy-Schahn R, Becker T, Welzl H, Schachner M (Jul 1996). "The polysialic acid modification of the neural cell adhesion molecule is involved in spatial learning and hippocampal long-term potentiation". Journal of Neuroscience Research. 45 (2): 143–52. doi:10.1002/(SICI)1097-4547(19960715)45:2<143::AID-JNR6>3.0.CO;2-A. PMID 8843031. ↑ Stoenica L, Senkov O, Gerardy-Schahn R, Weinhold B, Schachner M, Dityatev A (May 2006). "In vivo synaptic plasticity in the dentate gyrus of mice deficient in the neural cell adhesion molecule NCAM or its polysialic acid". The European Journal of Neuroscience. 23 (9): 2255–64. doi:10.1111/j.1460-9568.2006.04771.x. PMID 16706834. ↑ Senkov O, Sun M, Weinhold B, Gerardy-Schahn R, Schachner M, Dityatev A (Oct 2006). "Polysialylated neural cell adhesion molecule is involved in induction of long-term potentiation and memory acquisition and consolidation in a fear-conditioning paradigm". The Journal of Neuroscience. 26 (42): 10888–109898. doi:10.1523/JNEUROSCI.0878-06.2006. PMID 17050727. ↑ Leshchyns'ka I, Liew HT, Shepherd C, Halliday GM, Stevens CH, Ke YD, Ittner LM, Sytnyk V (2015). "Aβ-dependent reduction of NCAM2-mediated synaptic adhesion contributes to synapse loss in Alzheimer's disease". Nature Communications. 6: 8836. doi:10.1038/ncomms9836. PMC 4674770 . PMID 26611261. ↑ Jensen M, Berthold F (Dec 2007). "Targeting the neural cell adhesion molecule in cancer". Cancer Letters. 258 (1): 9–21. doi:10.1016/j.canlet.2007.09.004. PMID 17949897.